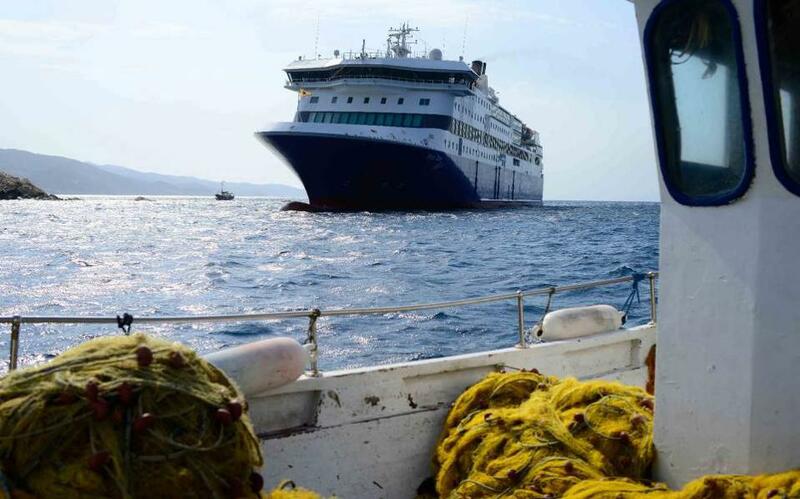 Expert divers are expected on Wednesday afternoon the assess any damage that may have been sustained by the Blue Star Patmos ferry boat after it ran aground just before entering the port of Ios in the Aegean in the early hours of the day, carrying 206 passengers and 87 crew. All of the ferry’s passengers and crew were taken to shore safely after other ferries in the vicinity and dozens of fishermen immediately responded to its distress signal when it hit a shoal or rocks as it sailed into the island’s harbor on its regular route from Piraeus to Syros, Paros, Naxos, Ios, Santorini and Anafi. The ferry, which is being monitored by the coast guard, is also carrying 21 cars and 12 trucks that are still in the parking garage, while experts are expected to recommend ways for its safe removal after gauging what if any structural damage it has sustained.